You guys. It’s Meatball Monday. Wait, isn’t it supposed to be meatless Monday? No, not on this blog because today is Monday and I’m sharing a meatball recipe. So it’s Meatball Monday! How cheesy is that, Meatball Monday? It ranks pretty high on the cheesy-ness factor and that’s ok. One of my areas of expertise is cheesy-ness, and that includes the food type as well. But as much as I love all things cheesy, you won’t find any cheese in these meatballs. Rather you’ll find chicken and robust asian spices with a kick of heat that comes from my friend Sriracha Sauce. 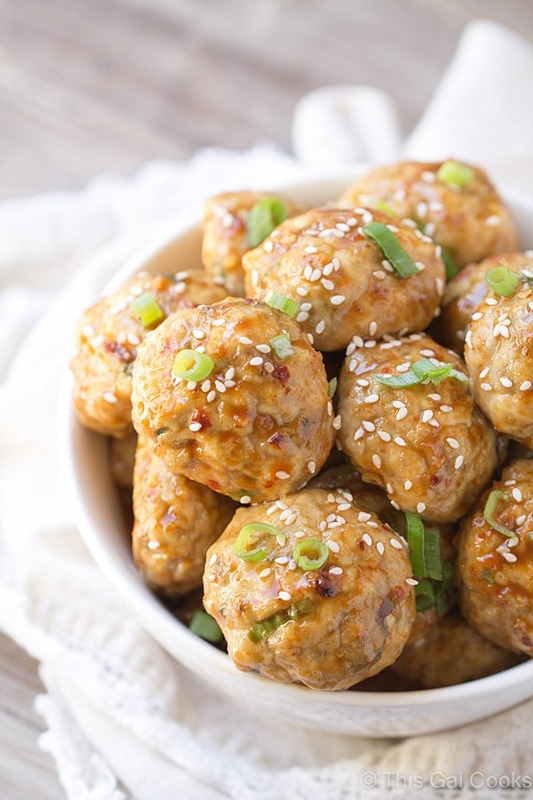 Ken and I LOVED these Spicy Asian Chicken Meatballs. I can always tell when he really likes something I make. He always gets seconds. Or maybe he is just extremely hungry. I think it’s a little of both. Right after I made these, we ate them by themselves. No sides. No rice to serve them over. Just straight from a bowl. They were that darn good. The following night, we ate the leftover meatballs over some rice. It made for a perfect quick meal after a long day at work. Since I made these rather early in the day, I needed to keep them warm while they were waiting to be devoured by us. I just threw them into my slow cooker and turned the heat setting to warm. Worked like a charm. You could do this for a party or gathering, too. Enjoy the recipe. 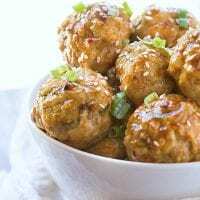 Delicious meatballs made with ground chicken and robust asian spices with a kick of heat that comes from Sriracha Sauce. Preheat your oven to 400. Line a baking sheet with aluminum foil. Lightly spray with cooking spray. Remove any excess spray with a paper towel. While the meatballs are baking, make the sauce. In a sauce pan, whisk together all of the sauce ingredients, minus the cornstarch. Once the ingredients are mixed well, gradually whisk in the cornstarch until the sauce reaches your desired thickness. Place the cooked meatballs in a large bowl and pour the sauce over top. Toss to coat. Garnish with sesame seeds and green onions. The meatball mixture is very sticky. In order to easily roll the meatballs, this is the method I used. I portioned off each meatball and placed them on the baking sheet. Then I rubbed a little sesame oil on my hands and rolled each meatball portion into a ball. This prevented the meat mixture from sticking to my hands. Try these recipes from other bloggers. Korean Style Cocktail Meatballs from Spoon Fork Bacon. Teriyaki Meatballs from Mom on Timeout. Crockpot Turkey Meatballs from Sally’s Baking Addiction. More appetizer recipes from This Gal Cooks. Meatball Monday… love it! 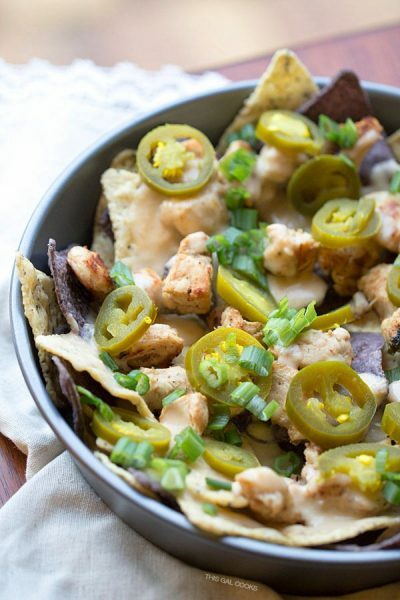 These look delicious, and thanks for the slow cooker tip! I can get behind Meatball Monday! These look delicious. I’d eat them by themselves, too! These sound amazing and look beautiful! Pinned! Meatball Monday! I love it, meatball Monday definitely gets my vote. These are perfect! 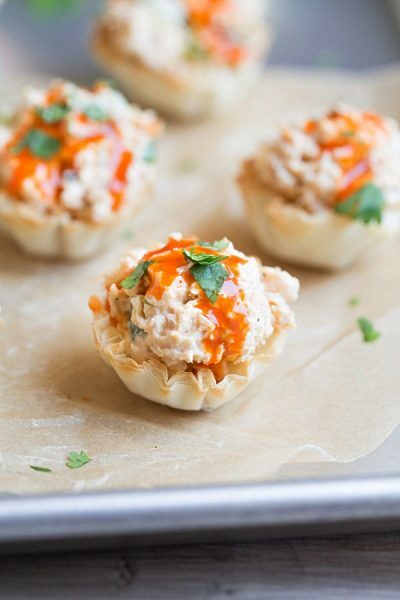 Love the Asian flavors and that kick of sriracha heat! Hooray for Meatball Monday! Ha, maybe I should start a trend with this. I guess I better get to making meatballs, huh?! Thanks for stopping by, Allie! I love meatballs! They are little flavor packed bites of goodness. This spicy Asian flavor looks particularly tasty. They would be awesome with some stir fried vegetables! Pinned! I’ll definitely take meatball Monday over meatless Monday!! Yeah! Another one for the meatball Monday team! These meatballs look irresistible! I love the spicy sauce! 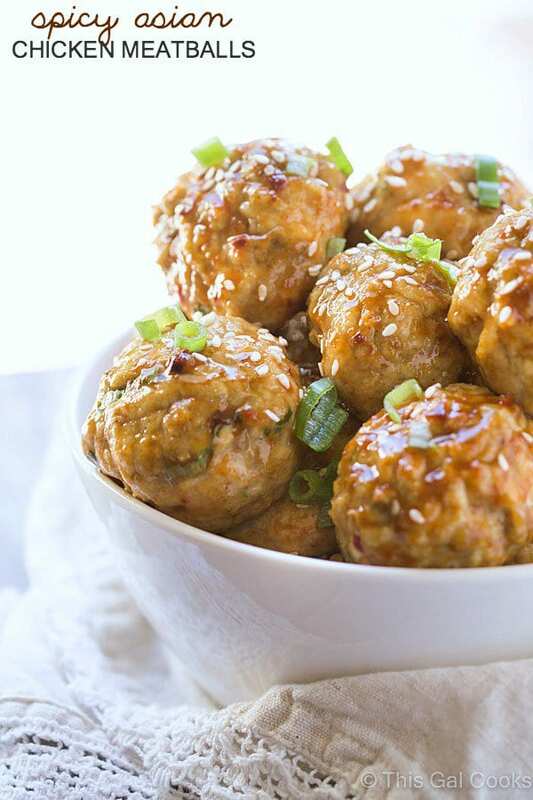 Love anything with asian flavor, these meatballs are so going down on a game day! They are perfect for game day, Krista! Thanks for stopping by! 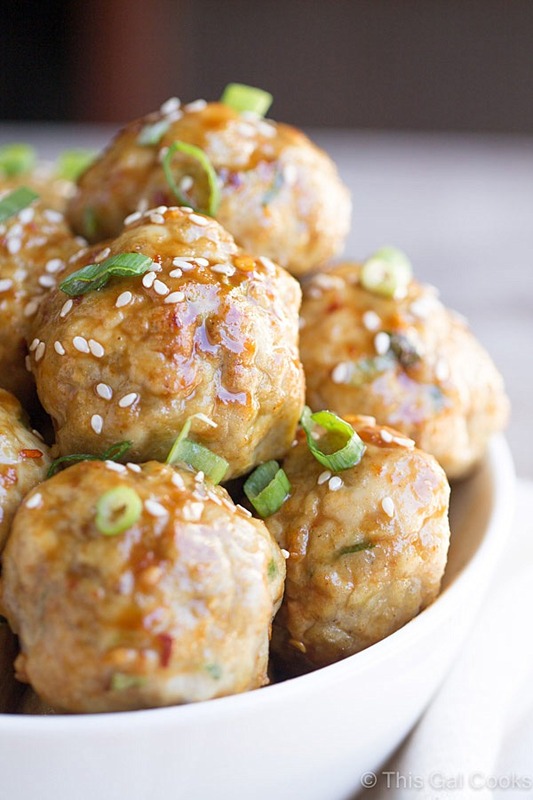 LOVE meatballs and LOVE food with an Asian flair! I can’t wait to try these. Thank you, Erin! I hope you enjoy the meatballs! Thank you, Blair! I hope you enjoy the recipe. Thanks for the tweet and the pin, too! I’m confused….you say 1 lb of ground chicken breast and then 1 lb of ground chicken breast (50% less fat). Do you mean 1 lb ground dark meat chicken and 1 lb ground chicken breast? It’s 1lb of ground chicken breast and 1lb ground chicken (50% less fat). I’ve corrected the ingredients list. Thanks! I just went to correct the recipe and it actually says 1 lb ground chicken breast, 1 lb ground chicken (50% less fat). The 50% less fat ground chicken is a mixture of dark meat and chicken breast. Hope this helps. Thanks! I need about 27 of these right now! Thanks for linking up with What’s Cookin’ Wednesday! You’re welcome, Karly! Thanks for hosting the party and for stopping by! Nice menu for a perfect time. It is similar to some Indian recipes. And I love eating such things, spicy, hot, and sour. But this looks tastier than mine! These look to die for! Love meatballs for snacking. Hi, can I also use only the ground meat chicken of is the chicken breast an indispensable ingredient?